We like to celebrate Halloween with a fun family party where we play games with glow sticks, bowl with pumpkins, eat fun snacks, and wrap each other up as mummies in rolls of toilet paper. And of course we add some fun picture books to our family celebration. 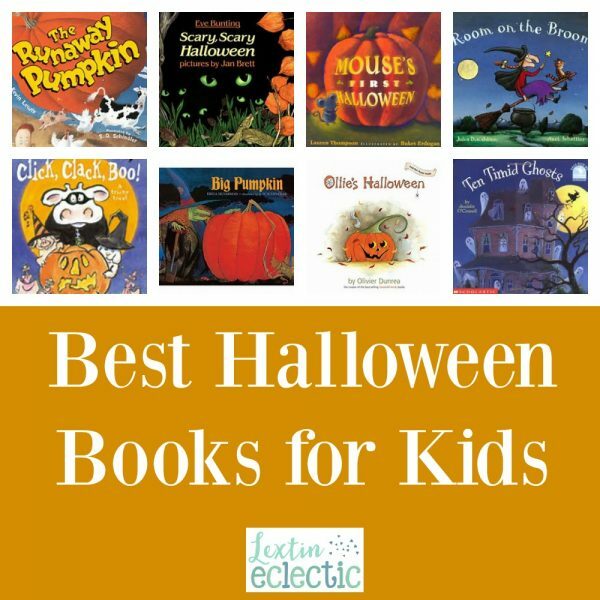 Here are our favorite picture books for Halloween! The wind causes the witch to lose her wand, her hat, and her bow. Helpful animals return the witches things but there may not be enough room on the broom for all of them. This big pumpkin is impressive and the animals want to show it off. But can they stop the runaway pumpkin?? Two little mice work together to grow the biggest pumpkin ever! Rebecca never wants to eat pumpkins again after eating them often as a child. But when an overloaded truck dumps a giant pumpkin in her yard she buries it and gets more pumpkins than she can manage the next year. The goslings go trick-or-treating and decide to share their treats with Ollie. Join mouse as he experiences the sights and sounds of his first Halloween night. A rhyming book about the antics of 5 pumpkins on Halloween. Farmer Brown cannot escape the Halloween antics of his farm animals. It’s Halloween, and ten timid ghosts in a haunted house have a problem: A mean witch is preparing to move in and scare them away, one by one! Young trick-or-treaters learn to count from ten to one as each ghost flies away from the witch’s spooky tricks.